1968: Sunset Boulevard, Hollywood. Since being discharged from the army, Elvis Presley had done a string of films but the offers had dried up. He hadn’t performed live since 1961, he was abusing amphetamines and there was this band dominating the charts called The Beatles. The pair would go on to form a close working relationship and bond. This weekend Binder, 83, is a special guest of the Parkes Elvis Festival, where he’ll answer questions from fans and provide personal insights at a screening of the ’68 Comeback Special, the melange of lavish sets, dance numbers, improvised jamming and live performance Binder masterminded that is widely credited with having resurrected Presley’s career and general hip-swinging mojo. 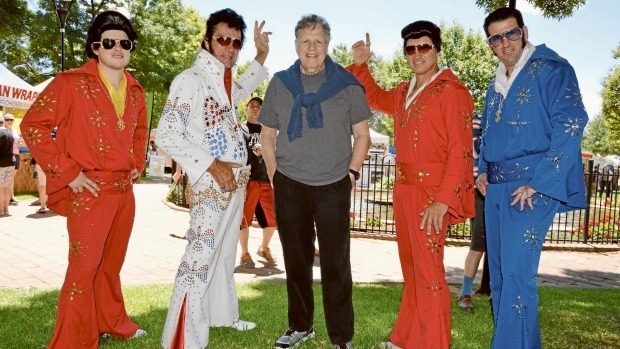 Steve Binder meets Elvis impersonators in Parkes for the annual festival in memory of the King. Photo: Bill Jayet. Elvis baulked only twice during shooting for the special, recalls Binder. First, when asked to wear a gold lamé suit; and second, when he lost his nerve just minutes before he was due to perform a semi-improvised set in front of a live studio audience. It was remarkable watching Presley’s confidence return, Binder says. And it’s charisma that Binder will be looking for first and foremost when he judges at the festival’s Ultimate Elvis Tribute Artist Contest final tonight. It’s the first year the festival has become endorsed by Elvis Presley Enterprises, Inc, and the stakes have risen for the 17 entrants, with a $3000 trip to the world final in Memphis, in August, up for grabs. Read the story orgininally published in the Sydney Morning Herald, here.